Virgil I. "Gus” Grissom, the astronaut slated to be the first man to walk on the moon, was murdered, his son has charged in the Feb. 16 edition of Star magazine. "My father’s death was no accident. He was murdered,” Grissom, a commercial pilot, told Star. Grissom said he recently was granted access to the charred capsule and discovered a "fabricated” metal plate located behind a control panel switch. The switch controlled the capsules’ electrical power source from an outside source to the ship’s batteries. Grissom argues that the placement of the metal plate was an act of sabotage. When one of the astronauts toggled the switch to transfer power to the ship’s batteries, a spark was created that ignited a fireball. Scott Grissom told Star that the motive for his father’s killing may have been related to NASA’s desire not have his father be the first man to walk on the moon because of criticism leveled at Grissom in 1961 after his Mercury capsule, Liberty 7, sunk in the Atlantic. Critics of Grissom, including novelist Tom Wolfe, have claimed the astronaut panicked when his space capsule landed in the ocean, and he prematurely pulled an explosive charge to open the ship’s hatch, causing it to sink. The threats were serious enough that he was put under Secret Service protection and had been moved from his home to a secure safehouse. During the congressional hearings, Sen. Walter Mondale questioned the efficacy of manned space programs. Manned space flights were opposed by many of the leading space scientists at the time, including Drs. James Van Allen and Thomas Gold. (HOUSTON) February 1, 2003 – The family of Astronaut Virgil I. "Gus" Grissom, the commander of the Apollo 1 spacecraft that died during a fire on the launch pad on January 27, 1967, is extending their "heart felt condolences" to the families of the astronauts who died today during re-entry of the space shuttle Columbia. Mrs. Betty Grissom, Captain Scott Grissom and Mark Grissom, know exactly what these families are going through "and want to make sure that these parents, spouses, brothers, sisters, and most of all, children, know that our hearts go out to them after this tragic event." "My husband, like these other Columbia astronauts, made the ultimate sacrifice for science, space exploration, and their respective countries," said Betty Grissom, "and I know Gus will be there to greet them, wherever that may be." Captain Scott Grissom, now an airline pilot for FedEx, recalls the death of his father clearly, and believes the United States should continue its manned mission in space. "My dad was on record for wanting the mission to continue in the event of a catastrophe," Captain Grissom said. A few weeks before the fire in the Apollo 1 spacecraft, Commander Gus Grissom said "If we die, we want people to accept it. We're in a risky business, and we hope if anything happens to us, it will not delay the program. The conquest of space is worth the risk of life." Betty Grissom said "I also hope that people of all nations, will put aside our differences today in a moment of silence, and say something special in their own way for each of these astronauts and their families today." August 29, 2005 -- Connecticut schoolgirl Amanda Meyer is in Florida today, hoping to persuade the U.S. Astronaut Hall of Fame to relinquish a Mercury spacesuit that itself is on loan from the Smithsonian Institution. Meyer, 15, under the self-described inspiration of the late astronaut Virgil "Gus" Grissom's family, has collected over 2,000 signatures on a petition she started to 'save the suit' Grissom donned for his 1961 Mercury-Redstone 4 space flight. The silver pressure garment, contests Meyer, needs to be "returned" to the Grissoms, rather than stay with the Smithsonian, which holds the title from NASA to all retired flown spacesuits. Meyer, who has said she hopes to be an astronaut herself someday, based her petition on the contact she has had with Scott Grissom. He claims that his father brought the suit to their home to prevent NASA from discarding of it, a situation NASA contests, citing a handwritten agreement that documents that Gus Grissom borrowed the spacesuit for his sons' school show-and-tell presentation in mid-1965. The Grissom family held onto the spacesuit after the 1967 Apollo 1 fire took the astronaut's life until 1990, when they placed it on display at the U.S. Astronaut Hall of Fame in Florida. The Hall was founded by the six surviving Mercury astronauts. 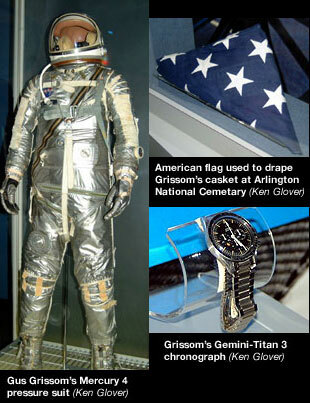 In late 2002, the Grissoms attempted to assert that the spacesuit was their property after the Hall was acquired by the Kennedy Space Center Visitor Complex. Their claim was rejected by NASA and the suit remained on display. As a compromise, Meyer wants the spacesuit moved to the Grissom Memorial Museum located in the astronaut's hometown of Mitchell, Indiana. While some Grissom family members have reportedly expressed their support of the suggested move, widow Betty Grissom is said to prefer its display at Walt Disney World's Epcot Center in Orlando. Regardless the outcome of her meeting today, Meyer may find opposition from the Smithsonian Institution, which has said the spacesuit will remain at the Hall of Fame until at least the end of the year, when their loan agreement is due for renewal. Even if the Institution decides to move it, the suit may go to a museum other than Grissom's hometown. January 20, 2003 -- While everyone's attention has been focused on Florida and the fate of Virgil "Gus" Grissom's Mercury spacesuit (currently residing at the Astronaut Hall of Fame), his Liberty Bell 7 helmet has been resting quietly in Indiana. 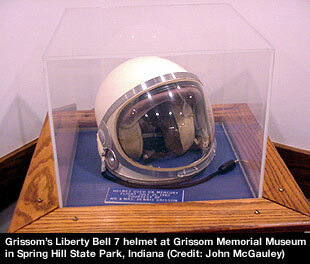 According to an article in Sunday's Hoosier Times, a plaque inside the helmet's glass display case at Spring Mill State Park explains that it was donated by Grissom's parents, Dennis and Cecile. How the family came into possession of the helmet is not exactly known, but the Park's manager believes it was a gift from NASA after the Apollo 1 fire. Not so, says Max Ary, director of the Omniplex Science Center in Oklahoma City, who suggests that the helmet was probably taken by the astronaut at the same time as the suit. Ary was also able to confirm that the serial numbers on the helmet in Indiana matched the flight unit. Though NASA had previously declared ownership of the helmet when it was believed to be residing at the Hall of Fame, it is not yet clear how the space agency will choose to act, if at all. November 21, 2002 -- Betty Grissom and her son Scott are returning home, having collected the 15 artifacts they loaned to the Astronaut Hall of Fame but foregoing for now the recovery of their husband/father's Mercury spacesuit. The Grissoms' lawyer, Jim Fallace met with NASA and Delaware North representatives yesterday to discuss the family's concerns. The 90-minute meeting held at Fallace's offices led to the parties agreeing to leave the spacesuit at the Hall of Fame while the issue of owernship is explored further, according to a report by the Orlando Sentinel. November 20, 2002 -- An anticipated confrontation between the family of Virgil "Gus" Grissom and NASA officials failed to materialize yesterday after lawyers from both sides agreed to meet today. In contention is the ownership of the late astronaut's silver Mercury spacesuit, currently on display at the Astronaut Hall of Fame. NASA spokesman Robert Jacobs told collectSPACE that the agency has located the handwritten loan agreement between Grissom and NASA for use of the suit. Grissom borrowed the suit for his son's show-and-tell presentation in mid-1965. The suit remained in the custody of the Grissom family two years later when the Apollo 1 fire claimed the life of three astronauts including Grissom. NASA was aware the suit was being well taken care for and saw no reason to request its return, said Jacobs. When the Astronaut Hall of Fame opened in 1990, the Grissom family delivered the suit, along with other artifacts for display as part of an exhibit honoring the astronaut. When the Hall was sold this year to the same company responsible for the Kennedy Space Center Visitor Complex, the Grissoms withdrew their loan. In a letter dated November 8 to its new custodians, NASA advised "the Mercury 'Liberty Bell 7' spacesuit, boots, gloves and helmet worn by Virgil I. 'Gus' Grissom are the sole property of the U.S. Government and that Delaware North Parks Services of Spaceport, Inc., should not release these items to any parties without written direction from NASA." The agency has no objection to the return of the other artifacts loaned by the Grissoms. Staff at the Hall of Fame have prepared the items for return to the family. Grissom's widow and son have stated it is their belief that NASA had a deliberate hand in the death of their husband/ father. Betty Grissom withdrew the artifacts to prevent what she described as the agency prospering from its display. November 19, 2002 -- When the Astronaut Hall of Fame reopens after renovations, it will be missing artifacts that spanned the career of one its first inductees. The widow of Virgil "Gus" Grissom has withdrawn the loan of her husband's effects in objection to the recent acquisition of the Hall of Fame by Delaware North Park Services of Spaceport, Inc. In addition to medals, patches, and even a replica of a sandwich flown aboard Gemini 3, Betty Grissom has demanded return of the Mercury 4 pressure suit, leaving her at odds with NASA. The space agency insists that they never released ownership of the suit, despite it being in the custody of the Grissom family since mid-1965. NASA loaned Gus Grissom the suit to share with his son's classmates and he never returned it. In 1990, Grissom's family delivered the suit (with helmet, gloves, and boots) to the Hall of Fame. Grissom's son, Scott posted his displeasure at NASA's attempts to assert ownership to an Internet newsgroup dealing with space history. "Why steal a space suit from a widow who gets $1200/month," wrote Grissom. "I guess it's because they can." This is not the first time the Grissoms have confronted NASA. On his website, Scott has called for a new investigation into the cause of the Apollo 1 fire which claimed his father's life. "Scott now believes NASA knew his father died from an act of sabotage and deliberately covered it up in its race for the moon," explains the site, apollo1.info. That same belief lead Betty Grissom's efforts to prevent the space agency from benefiting from the artifacts. The Hall of Fame's new owner, Delaware North operates the visitor complex for NASA's Kennedy Space Center. Both mother and son were expected to arrive at the Titusville, Florida-based Astronaut Hall of Fame Tuesday to collect Grissom's possessions. NASA plans to return all but the spacesuit to the Grissoms. Gentlemen, if you wish to debate this subject fair enough, but let's not go down the road of a cut and paste war. The last article is extremely long and contains only two sentences that have any relevance to the claims and even that presents no more evidence to back up the claims. It's an interesting article that's relevant to the fact that Gus Grissom and his family have been treated like crap by nasa .... All they want is the truth to be known , but of course when it comes to going up against the all powerful nasa , proving any of their wrong doing seems to be a complete impossiblilty . Here's a follow up to the article above about nasa's mistreatment of the Grissom's ... If this or the previous article I posted are too long or unimportant for some people's attention spans , then don't read them. I have emailed, faxed, called and wrote the Vice President atleast once a month since October 2005, but he refuses to repond to me as of yet . Dan Bortner of the Indiana State Park Services told me on the 28th of October the official letter requesting Gus Grissom's Mercury 7 space suit was sent out to the Smithsonian . Claire Brown of the Smithsonian's Air and Space Museum has sent me a letter saying no requests were made and the lease was renewed with the Astronaut Hall of Fame for another 2 years . She also tried to intimidate me by "cc"-ing the office of Counsel on this letter, telling me to remove things from my website. I have now contacted every senator, and asked the Vice President of the United States to speak before the Senate, for my family and I will not be intimidated by anybody. I have the right to express my feelings on my website without being harassed. If everybody can contact their senator and ask that I can speak before the senate. The government should know and expose these types of situations . On Sunday November 27th, ABC News aired a newspiece about the petition, and on the same day the New York Times ran a front page article in the Connecticut Section. To see the news clip, go to http://abcnews.go.com/WNT/Science/story?id=1362640 and for the NYT article go to http://select.nytimes.com/gst/abstract.htm...DA80994DD404482 . I have been involved with NASA since I was 8 years old and my goal since then has been to make a change for the better. I have always been in awe of the bravery of the astronauts, who are willing to risk life and limb to pursue knowledge. My all-time hero of these elite men was Virgil Ivan, AKA Gus, Grissom. I never really knew what first made me idolize him so, but there was something about the way he was that pulled me in. Ever since that day my mother told me of what he did for our nation, I could not help but wish to be as he was. Now, about 7 years later, I know what I want to do in this life, I want to do as Gus did, change the world forever, for the greater good. On February 17, 2005, I spoke to Gus' son, Scott, and he told me disturbing news. He told me the story and ongoing drama that involves his father's Mercury 7 suit. He said that after his father's flight in the Liberty Bell 7, NASA was going to throw out the suit, but his father wanted it. So he pulled it out of the dumpster and kept it. This happened in 1965. NASA was fully aware he had the suit, and they did not care. Since the fatal Apollo 1 accident, his family would "lend" it to different museums, exhibits and ceremonies to keep his memory alive. When the family lent suit to the Astronaut Hall of Fame, NASA decided to keep the suit, and refuses to give it back. Hence, the formation of this site. I believe NASA should give the suit to its rightful owners, the Grissom family. NASA now have has it under false pretenses. If you sign my petition, you are helping to put the pressure on NASA to give back the suit to the Grissom family. Click the links below to send an email, to have NASA, Delaware North, and the Smithsonian follow the ethical and honorable course, to send the suit back to the museum of a man who gave the ultimate sacrifice for this nation. Please support this by emailing your name to the following! If you could please go to www.congress.org , there is a feature there called the soap box, and if you could look under space topics, you can find more updates. Also, the more hits I get on the soap box, the more people will see it, so please check it out so more people can find it. It's an interesting article and relevent to the fact that Gus Grissom and his family have been treated like crap by nasa .... All they want is the truth to be known , but of course when it comes to going up against the all powerful nasa , proving any of their wrong doing seems to be an impossiblilty . Too long for some people's attention spans...?! That is a somewhat ironic comment. What these articles are relevant to is Betty Grissom's long held grief over her husband's death, the duration of which is the result of a complex set of psychological and emotional factors stemming from the fact that she and her husband, Gus, were by all accounts about as close as any two people could be, very private, and relished each other's company, as well as their children's, in the extremely limited times when they could all be together. It was, apparrently a marriage that defined the term. At any rate, the mechanics of such long held grief, and the developing victim-consciousness that leads to various claims designed to get someone out there to own up to responsibility, and thus somehow, ease their pain, is all too common. It is also sad, and a waste of life, especially when there isn't anything to actually substantiate such claims, and since responsibility was already claimed for the incident. "Spaceflight's terribly unforgiving--of carelessness, incapacity, or neglect. "We were the cause. The simulators weren't ready. Our software in Mission Control didn't function. Procedures weren't complete; nothing we did had any shelf-life...and no one stood up and said, "Damn it, stop!"" ...there is no question as to who was responsible, and there never was any question. Her husband's death, perhaps especially the manner in which it occurred...that meaning on the ground during a countdown demonstration test...rather than where she, and most certainly her husband, would've expected such a potential to occur (and Gus certainly was cognizant of the risks of his profession...in flight, that is), likely fed her claims, many outlandish, that sabotage and murder were at the root of the Apollo 1 fire. This is sad, but most certainly understandable. Of course, these claims were found to be without scientific, physical, engineeering, or legal basis, but she still pursued her quest, filing wrongful death suits against contractors and NASA, and was determined, so it seems, to see criminal responsibility affixed somewhere for her loss. As she aged and her health suffered some, her son Scott took the torch and has continued the process. However, given that NASA, and its contractors involved with the CSM, were entirely responsible for this disaster, one has to reasonably wonder what one could possibly wish as a result. We were involved with a high-risk engineeering project. Every contractor, every controller, every manager, and every astronaut, including of course Gus Grissom, Ed White, and Roger Chaffee were involved, were responsible, and were completely cognizant of the risks and the potential for disaster. Is a criminal responsibility even plausible? Is it applicable? Does it make any sense at all? Of course not. It was an acknowledged risk, and it happened. The results of such an occurrance, in such a project, must be that analysis is done, changes are made, improvements are tested, and we move on toward the success we want, based upon what we have learned in such a harsh fashion. Of course, that happened. Anything else would have been criminal. These articles are about the grief of a family, and their dealings with NASA. It has nothing to do with the "truth" of Apollo 1's fire, nor with NASA admitting their wrongdoings (they did that already). It is the Grissom's right to do what they feel they should, or what their emotions compel them to do. However, given that their husband and father fully accepted the risk inherent in his chosen line of work, and would've insisted (as he did) that in the event that he died in this effort that the agency would move on and succeed, it seems a waste of energy for the family to keep seeking someone's criminal responsibility. They of course haven't succeeded in that effort. I think that Gus himself wouldn't support this effort, and would've relished the success that sprang from the circumstances surrounding his death. I certainly feel for the Grissoms...but I do not think that their present efforts are much more than a waste of energy, and a painful dwelling upon the past, a past which created a future that was exactly what Gus would've wanted. Better would be to work toward preserving the memory of a great man, and his crew mates, and the sacrifice they willingly made. This business about the family's dealings with NASA is a personal matter which speaks to nothing but their own personal feelings. Thus, I'm certain it will make no difference to certain persons! Indeed, I think certain attention spans won't even read what was written, as has been a repeating pattern. And of course, if it's too long for your attention span...don't read it! straydog, you were one of those that asked for Apollo threads to be on specific aspects of the conspiracy case. You chose this subject matter so it shouldn't be beyond the realms of possibility for you to remain on topic. That topic, chosen by you, is whether the Apollo 1 fire was murder. The argument over the Mercury suit has no relevance what so ever to that subject. Please keep on topic. If this or the previous article I posted are too long or unimportant for some people's attention spans , then don't read them. You are also aware of the rules about insulting people. If you have forgotten them please re-acquaint yourself with them. If you can't keep to the rules then don't post. Members are encouraged to set a good example by treating newcomers to the boards in the way that they would want to be treated themselves, respect other members and act responsibly in threads. Members who derail topics with flaming, trolling or the instigation of 'flame wars' will be removed from the forum. "No flaming, flame baiting, mocking, verbal abuse or trolling"
I didn't do any of those things .... You were the one that said my post article was too long , and so I assumed you meant that people would not want to take the time to read it ... I understand attention spans are short in today's society of instant gratification and time limitations , so it is understandable that lengthy articles are not for everyone ... but as you can see by the amount of people who have already read this thread that the articles are not too long and do interest a lot of people ..
Then you accused me of going off topic ... but I think nasa's complete disregard for the grieving family of Gus Grissom is completely ON topic ! ... As if nasa hasn't taken enough away from the Grissom's already , they now refuse to return to them his spacesuit ! .... The family has had this suit in their possesion for decades because nasa had such disregard for it, that it was thrown out in a dumpster ... But now it's so important to nasa that they refuse to return it to Grissom's widow .... Unbelievable !! Here is another article which discusses nasa's incompetance in the horrible deaths of the Apollo 1 astronauts . The space shuttle Columbia explodes in space. There were seven astronauts aboard, including the first Israeli to travel to space. There were no survivors. Terrorism is not suspected. TELL US THE TRUTH, UNCLE SAM! In recent years the government has tampered with the truth so frequently that the phrase "credibility gap" has gained common acceptance. Like most slogans, it is not always used fairly. Official pronouncements which turn out to be wrong sometimes are the consequence of bad judgment instead of dishonesty . . . Yet even after the most charitable allowances are made, the public record remains littered with official lies which no amount of explanation can erase or mitigate. By deceit, bureaucracies seek to hide bungling that would justify the censure or dismissal of their administrators. Consider what the National Aeronautics and Space Administration (NASA) tried to foist off on the public last year (1967). NASA spends $11,500,000 of the taxpayers' money annually and employs 300 press agents to glorify itself. It initially enjoyed immunity from independent scrutiny and criticism. On the night of January 27, 1967, fire erupted in an Apollo space capsule at Cape Kennedy. Three brilliant young astronauts were suffocated, and our whole program to put a man on the moon was set back a year. NASA attempted to depict the tragedy as simply a bad-luck accident which could not possibly have been avoided. Death was "instantaneous," it announced. "There was a flash and that was it." "We always have adhered to the highest standards of safety," intoned a space boss. "And yet, in spite of meticulous attention to the smallest detail, this tragedy has occurred." Soon, these reassurances were shattered. New York Times and Washington Evening Star reporters learned from engineers who had heard tape recordings that the three deaths had been far from "instantaneous." The astronauts pleaded for help and, as the Times disclosed, up to the very end "they were scrambling, clawing and pounding to open the sealed hatch." Rep. William F. Ryan (D., N.Y.) Unearthed proof out of NASA's own files that, as a result of previous blazes, it had been warned repeatedly of the danger of fire in the capsule. Yet it made no provision for emergency escape. Next, several Senators asked NASA officials if Maj. Gen. Samuel A. Phillips had not submitted a report devastatingly critical of the Apollo program. "I know of no unusual General Phillips report," replied George E. Mueller, an associate administrator of NASA. The agency admitted that General Phillips had made some "notes." But it belittled their importance, and NASA boss James E. Webb refused to let investigating committees see them. Rep. Ryan obtained a copy of the Phillips report from a secret source. Instead of a few "notes," it was a voluminous document full of charts and evidence. It found the principal Apollo contractor, North American Aviation, Inc., guilty of disastrous mismanagement and waste, and showed that the entire Apollo program was jeopardized by dangerously poor workmanship and skyrocketing costs. Yet additional evidence demonstrated that NASA had done little to correct the conditions pinpointed by Phillips. Now some Congressmen began to wonder. Had there been favoritism in awarding North American the $5 billion Apollo contract in the first place? A "Source Evaluation Board" of 190 scientists and business advisers had recommended a contractor after an exhaustive study. Had it been North American? On April 17, the Senate Space Committee summoned Webb. Sen. Margaret Chase Smith (R., Maine) asked the direct question: "Was North American the first choice of the Source Evaluation Board?" "Yes. It was the recommended company," Webb said categorically. Three weeks later, Senator Smith had the facts - and called Webb back to testify. She asked if it was not true that the experts actually had rated Martin Marietta Corp. above North American. Webb at last admitted that North American was not picked by the experts. Apollo 1: Sabotage, Murder and Cover-Up? This 90-minute interview is an in-depth look inside the private lives of Betty and Scott Grissom. Since the death of Gus Grissom in 1967, the Apollo 1 spacecraft has largely remained forgotten -- until now. The Grissoms speak out in this candid interview and revisit the astronaut's youth, flying career, astronaut days and his untimely death. Scott Grissom, a commercial airline captain, obtained access to Apollo 1 under the Freedom of Information Act. Hoping to determine whether the spacecraft could be salvaged for dignified public display, he accidentally discovered a mysterious fabricated metal plate as part of a critical switch assembly. Scott got more than he bargained for when he found himself learning the very systems his father studied over 30 years ago. Scott now believes NASA knew his father died from an act of sabotage and deliberately covered it up in its race for the moon. This interview was originally recorded and published by AirlinePilots.com, and is reproduced here with permission of Digital Television Network, Inc..
Apollo1.info is dedicated to re-opening the investigation into the deaths of the Apollo 1 primary crew. Scott Grissom, son of Gus Grissom, believes he has uncovered evidence of sabotage. Go to this link to read more about nasa's complete incompetence , including causing the deaths of the Challenger and the Columbia astronauts .... Plus much more... Talk about a long article ... This one is a beaut !! I said no such thing. I said it was a long article which contained only 2 sentences relevant to the topic. I also asked for a discussion on the issue not a cut and post war. You responded by cutting and posting another irrelevant article. On the other hand, it is not amusing that you could possibly think that I placed a "rosy glow" on this story. That sounds almost insane. ...an insulated silver-plated copper wire in an ECU in the Apollo 1 CM, which also happened to pass over a leaking joint in an ethylene glycol / water cooling line, caused electrolisis to occur (by virtue of the silver anode provided by the wire's plating) in the ethylene glycol. This produced an exothermic reaction which ignited the glycol mixture, and in 100% oxygen at about 15 PSI, resulted in violent combustion. Apollo 1 affected many people profoundly. It had nothing "rosy" associated with it. Again, you use that term, "rosy". You do not understand what it says. This is apparent by this reference to the fact that I painted a rosy picture of a tragic incident that killed three men on a January evening some 40 years ago. How imbecillic that idea is cannot be stated clearly enough. I am certain you weren't around for that "rosy" evening in 1967. I was. It was one of the worse nights I can remember. You also don't seem to understand that what is transpiring between the Grissom family and NASA regarding ownership of Gus' suit is not in any way relevant to the issue at hand. As I said, it is a personal matter associated with a family's inability to let go, and the grief they still suffer from deeply. Your attention span is limited. It is limited in the respect that you cannot deal with lengthy posts. You may read them, but there is a point in them where you simply get irritated, and from that point on, you call it spin, and essentially ignore what is said. Further proof that you do not seem to be able to keep your attention focused on what's being pointed out to you. You post yet a couple other old articles (hint: these things are not new in any way, and are familiar to me...if not the rest of the folks here who have interest in these matters). Didn't I specifically tell you that NASA, and North American were in fact responsible for this thing? What is your point? It appears to me that you're drifting into this NASA responsibility thing, but that's already been established (that happed almost 40 years ago...). What you seem to be implying is the idea that NASA, or someone, murdered Gus Grissom, Ed White, and Roger Chafee. If this untenable and ridiculous idea is your actual topic, you've drifted. Of course, I can underdstand that. There is not, nor ever has been any jot of proof that such a thing could've occurred, or would've. The idea is ridiculous. MID, my comments about insults and personal attacks apply to everyone. I guess I got a little P.O. 'd at his ridiculous, and of course completely un-substantiated comment that I had somehow painted a "rosy" picture about an event that was horrific, and which personally affected me for weeks...(some people never got over it)...when all I actually did was to paint a realistic picture about it. I haven't looked into the death of Grissom and crew that much. It's not unexpected that the family would react by blaming NASA for the death. That is, for incompetence, for not taking proper precautions, and so on. It's quite normal to feel the need to assign responsibility for the tragedy to a specifc person or group. But it's quite a leap to sincerely believe the death was deliberate murder, and make those accusations become known to everyone. I think you're absolutely correct in that it is normal for people aggrieved to seek the assignment of responsibility, blame, or what have you in such a case. It is actually typical, as I indicated. I can truly make no judgments about the actions of the Grissoms in this matter. I personally feel it is a waste of energy, perhaps even a waste of life itself. I say that due to personal experiences in similarly horrid circumstances. Still, I am not them. I also agree that it's a humongous stretch to to think about murder as pertains to this event. I think this idea of sabotage, deliberate killing, is a singular thing that came from the mind of Mrs. Grissom, has been expanded upon by her son, and is their burden alone. Of course, such a thing is typically picked up on by those who seek some way to satisfy their somewhat inbred mistrust of everything governmental. Again, it would be incumbent upon those folks to provide a smidgeon of proof. That of course, has never been done, by them, or by the Grissom family. It's probably worth learning about...Apollo 1, that is, what actually happened that evening in Florida was bad enough, but a great deal of popular talk about it is filled with half-truths and mis-understandings. The most common misconception surrounds the idea that the men burned to death, and stories are proilific about the men screaming and pleading for help. This is unsubstantiated nonsense, given that there were only two roughly five second long radio transmissions from the spacecraft, containing two sentences. The last transmission ended with some sort of cry. It may have been pain. It may have been fright. One way or the other, everything stopped 17 seconds after the report of fire, 2 seconds after the CM ruptured from the rapid increase in cabin pressure due to the fire. 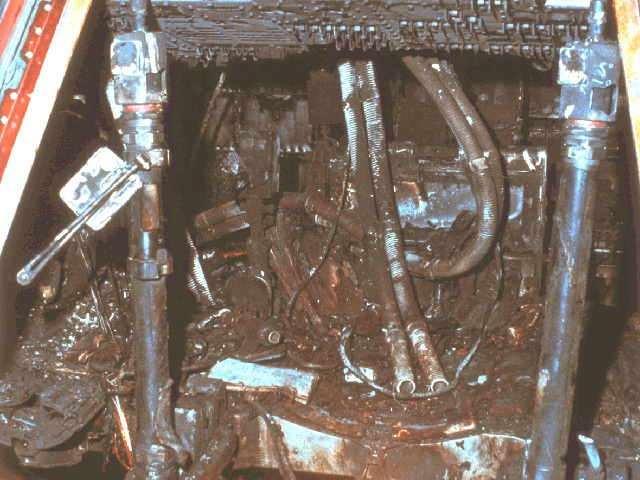 The major fire was out in 20 seconds, although the heat inside the spacecraft didn't subside, and CO levels were lethal at minimum 25 seconds after the fire began, and probably earlier. The men died of cardiac arrest due to CO saturation, which began when Grissom's suit failed (prior to the cabin rupture at 14 seconds after the fire started). The substantial and serious burns they received were not immediately fatal in nature, and odds are much of that occurred post-mortem...how much could not be determined. Others have made it seem a little too clean, by stating that the men died quickly of carbon monoxide poisoning. While the latter is true, the event was in no way pretty. Thus, it was not so horrific as three men burning to death, and it was certainly not a matter of a painless, easy death either. ...God, I can't talk about this anymore. That'll give you a little bit of information as pertains to the facts surrounding this one. MID, if it makes you feel any better breathing these levels of carbon dioxide combined with the methane and ethane gases produced by the fire would result in a very swift death indeed. After reading the report I feel confident that the majority of burns suffered were post mortem. Horrible event all around. Yes, from all post mortem indicators, unconsciousness was of rapid onset after the first suit failed (the suit loops all interconnected centrally, so the influx of toxic gasses (and there were several) would spread to them all rapidly once one suit was breached (a piece of Grissoms suit was ejected through the CM rupture, which took place 14 seconds after the fire started). Based on the positions the crew were found in, burning was likely not profound at the onset of unconsciousness. Nonetheless, once the pad crew and rescue personnel could actually see inside the spacecraft (when the hatch was opened, they couldn't see anything in there, even with flashlights because of the black smoke, for many minutes), the impression was...well, let's just say horrifying. The medical reports mention that some of the burns may have been received antemortem. Although unable to determine to what precise extent, the fact that they emphasised the burns in such a manner seems to imply that the majority were post-mortem. That is of some comfort, I should think. Nonetheless, it was indeed a horrible event all around. The men basically choked on toxic gasses and black sooty smoke...rapidly, of course, but choked and suffocated. Enough of this, though. I'll leave people to read the reports, which cover everything in graphic detail. What is truly irritating is that the uninformed, looking as they do for any thing they can to imply some sort of hoax or mis-conduct by authority, imply that this event, researched, studied, understood and documented to a profound extent as it was, could somehow have been the result of sabotage, and by extension, involved homicide...the homicide of a rookie astronaut and two bonified national heroes. This is as far over the edge as anything pertaining to Apollo mis-understanding, in my view. I suppose I'm a little touchy about this. I still remember the moment like it happened yesterday. MID .... I'm sorry if the article I posted on Gus Grissom's death brought back upsetting memories for you . It's a beautiful tribute to these very brave men who sacrificed their lives for the conquest of space and their dreams of man going to the moon . and we hope that if anything happens to us it will not delay the program. How does Clark MacDonald's account play into all of this? He said an electrical short caused by the changeover to battery power sparked the fire, and that NASA destroyed his report and interview tapes in order to stem any outside criticism of the program. And, that he broke 31 years of silence with the release of this information, not wanting to withhold the truth any longer. Does this have any implications regarding the Grissom family and their accusations? Or to the official NASA account in other ways? The memories of such events are always there, and of course people talk about Apollo 1 all the time. I appreciate the sentiments, and the link (you have pretty good taste if you're a Kerry Livgren fan!). The song seems to fit the premise of the site quite well. I don't know how the MacDonald account plays into all of this. I can assume that such an account might fuel the zeal of the family, or families of the crew in some way. I personally find fault in this account. The primary reason for this is that the Apollo 1 Plugs-Out Test was designed to essentially be a complete simulated countdown, sans-fuel loading, in order to demonstrate integration between all spacecraft systems and the ground power sources during the countdown, and then to verify no electrical interference at the point of changeover to internal spacecraft fuel cell power. The problem with MacDonald's account is that the Apollo-1 test proceeded to the point where everything was completed leading up to the plugs-out portion, where transfer to spacecraft power was to take place. However, communications difficulties had the launch team hold the count at the T-10 minute mark at 5:40pm EST. The crew and ground were checking all communications systems, attemting to isolate their problem when the fire occurred at 6:31pm. The count was still holding at 6:31pm, and the transfer to internal power had not yet occurred (the plugs-out part of the test never happened). Thus, I see no way for an electrical short to have occurred during changeover, when changeover never took place. MID ... You are very welcome for the Apollo Burning web site ... Yes, I agree with you about something ... finally ! ... Kerry Livgren is an incredible musician and song writer and his song was perfect for that presentation . The bottom line is , I am conspiracy researcher and believe that the Apollo Program was a hoax ... But I never meant for anyone to take personal offense to my opinions about this ... So I do regret the way this subject has been discussed in the past on this forum , on both sides . And apparently there are other people besides MacDonald and the Grissom's who don't go along with the official NASA version of what really happened that day on pad 34 .... Here is an article I found today which contradicts your and NASA's story .... There appears to still be some unanswered questions about what really happened and why .... and this is the reason why many people today are pushing to re-open the investigation on this . Son: "Dad, did you know the astronauts in the fire?" Lovell: "Yeah, yeah I did, I knew the astronauts in the fire, all of them." Son: "Will that happen again?" Lovell: "Well, let me tell you something about that fire, um, a lot of things went wrong. The door, called the hatch, they couldn't get it open when they needed to get out, that was one thing. And well, a lot of things went wrong in that fire." Son: "Did they fix it?" Lovell: "Oh yes, absolutely. We fixed it. It's not a problem anymore." Lovell's wife eavesdropping in the hallway looks relieved and is happy. Well, one thing they did not and could not fix that still would have been a major problem, unless Apollo was to undergo a complete redesign, is the fact that the lunar module (LM) and command module (CM) were supposed to have a pure or high-oxygen environment once earth orbit was achieved and when the astronauts were supposed to be on the moon. NASA's own tests in the early and mid-sixties, as listed at my web site at http://internet.ocii.com/~dpwozney/apollo2.htm indicated that such an environment was one spark away from disaster. Ralph Rene was recently a guest on the End Of The Line phone-in radio talk show. Ralph Rene wrote the book "NASA Mooned America". Here are excerpts from my notes from the portions of the radio show which discuss the Apollo 1 fire. My Notes Of Ralph Rene On The End Of The Line Radio Show Discussing The Apollo 1 Fire. Gus Grissom died in the Apollo 1 fire with two other astronauts in one of the most outrageously stupid events ever in an alleged scientific endeavour. Grissom was getting shaky about the CM (not even just the LM, which had other problems). Grissom hung a lemon on the module they were playing with. He was going to take it to the press. All this hardware was being constructed and put on line and built by the low bidder. Grissom, White, and Chaffee were ordered to take a test, a plugs-in test, which means all the circuits are live. When you throw a switch, when you look at a switch- plate, in a darkened room, totally dark, you throw it and you see a spark jump. Everytime you throw a switch, whether it is high-voltage or low-voltage, a spark flies, unless it has capacitors, and unless you make it explosion-proof. Electrical induction causes the spark. If you have a vapour in the air, like gasoline and air, and you throw a switch, boom. So they came up with fully explosive-proof switches, which really work. They are totally sealed hermetically. The spacecraft did not use these kind of switches because it was only 10 to 12 to 14 volts. They were going through this test hour after hour and when they tested it here on the ground, for some obscure reason, they pumped in the oxygen. This was not just breath- able oxygen, this was pure 100 percent oxygen. Everybody knows that when you work around oxygen, in a hospital room or wherever, there are warnings posted: "No Smoking, Oxygen Present". This is not even yet 100 percent oxygen, so there is always a danger when you have oxygen in any extra concen- tration than is normally present. To top that off, Rene just found out that, at the begin- ning of the Mercury program, NASA did all kinds of tests in pure oxygen environments. NASA found out there was a safe oxygen partial pressure limit for breath- ing between 2.9 and 6.7 psi. Breathing outside these limits would cause severe if not permanent damage. They put these men in a pressure chamber, the command capsule, and they began testing switches and all kinds of nonsense. Somebody decided to also pressure test that vehicle. They ran it up to 16.7 psi, according to Collins, or to 20.2 psi, according to Borman who chaired the committee. Grissom, Chaffee, and White were strapped into a capsule for a hot test on top of a rocket at the Cape. The hatch was shut, with a hatch that took about three minutes to open. In the best of circumstances the hatch was a brand new hatch that had never been used before. It consisted of three segments. The man in charge gave the order to pump pressure into that capsule when they knew that anything past 6.7 psi was deadly and they kept right on going to 16.7 psi (according to Collins) or 20.2 psi (according to Borman). With 100 percent pure oxygen at 14.7 psi, steel wool will burn from the heat of the match, it explodes. People who should know better were cranking in more and more oxygen. The next strange thing, coincidence let's call it, is that there were fire extinguishers always before in that test vehicle. In this time they were all absent. They also used the fire-resistant teflon sheets over the cushions, over the wiring harnesses, because wire has insulation which is a burnable. They were all absent. Here they are doing a plugs-down test, that means everything's live. They are throwing these switches, and again, after (knowing that) every one of their tests, with (high or pure percentage) oxygen in living quarters, etc., turned fatal or nasty. Every one of the pretests (turned fatal or nasty), there's seven of them listed in the book. In one of the pretests, at 7 psi oxygen, they tried to change a lightbulb. There is a little spark that happens when you screw bulbs in and out. The whole thing started burning, the guy's arm, not his clothes now, his flesh was burning. They grabbed an asbestos cloth. They threw it, wrapped the arm in it. The asbestos started burning. These are NASA's own tests. They take three guys, and put them in this capsule, crank in oxygen to 16-plus psi, and wait for a spark to go off. Grissom wanted to have the leader in the capsule with them. With 24 hours of time available, NASA did not put an extra cable into the capsule to allow the leader to have a headset circuit. Gus Grissom wanted Joe Shea, NASA's chief administrator, to go through the tests with the other three. NASA allegedly could not come up with a fourth headset in time for the tests. All you need is a splitter which you can just pop in, any kid can do it. These people were cremated in system similar to a calorimeter bomb (which is the device used to measure the caloric content of food). This is nothing complicated, just nineteenth century science. Government agents, in rapid action, raided Gus Grissom's and White's homes before anyone knew about the fire. They removed Grissom's personal papers and his diary. They did not bring his diary or any other paper with the word "Apollo" on it back when they returned some of his papers to his home. Murder begins at 6.7 psi pure oxygen. In 1967 Thomas Ronald Baron was allegedly run over by a train, after he went to Washington (to testify before the Apollo 1 Congressional investigating committee). He kept records of Apollo. (Baron was an inspector on Pad 34.) The day after he testified, his car in Florida with his wife and stepdaughter was run over by a train. They took the body away really quickly, and contrary to Florida law, there was no autopsy. The bodies were instantly cremated. Astronaut White's widow allegedly committed suicide a few (three) years later. She was not known to be suicidal and people were surprised. Rene gets the feeling that Grissom, White, and Chaffee, the Apollo 1 astronauts, were murdered because they knew or began to sense that Apollo was all a hoax. Rene feels that they perverted these heros, one, two, and three at a time. One of the strongest things you can do is to put men in uniforms and team clothing and outfits, and they get along, they bond really well. Guys that you did not know too well suddenly become your friends. On construction gangs you see it happen. If you threaten someone, half the time tough men will just look you in the eye and say "Go ahead". Joe Shea (NASA's chief administrator during Apollo 1) must have known this. He has never been questioned. Nobody has ever been questioned. Not even the clown who said "Let's go up to 16.7 psi (or 20.2 psi) with the pure oxygen". The conspiracy theory does not hold much water to me. Why kill all three on board just to get at Grissom. Grissom was the owner of a Corvette sports car that he was known to drive fast. Monkey with the car and you solved all your problems. And a week later you announce a replacement and go on. Why do something with the space craft and put the USA out of the man flight business for almost 2 years. In that time the Russians could have squirted ahead and landed on the moon before the US did. The space race would have been over and the USA a lagging second place. And the American public and Congress does not like to continue funding second place efforts. As far as the space suit, I e-mailed a friend who works for NASA earlier today. He said that the suit belongs to the US Government. That NASA does not just give things away. While NASA does lease suits and capsules, it is still property of the United States even when in museums. (And if not properly treated, the lease can and have been cancelled. The WW-II B-17 bomber the "Memphis Belle" was donated under lease to the City of Memphis, Tennessee. But the city did not take care of it and the US AirForce a couple of years ago cancelled the lease and removed the bomber from the city for proper restoration) He also said that all of the flight-used space suits are kept, and are not just discarded. So the "finding it in a dumpster" story is not true. Non flight suits are broken up for scrap if not needed and the parts sold to salvage companys. While the photos show a pristine suit. He said that NASA and the Grisson family have had problems for years. Besides the suit. It seams that the family wants a final say on what in fact is government property. The family wanted veto rights over the recovery of the Liberty-7 capsule when it was recovered from the ocean bottom a few years ago. And they wanted the capsule to be displayed where they wanted it. Not where NASA and the marine salvage company that recovered it under contract wanted it. So this seems to be more of a long war of words between NASA and the family. Grissom was the owner of a Corvette sports car that he was known to drive fast. Monkey with the car and you solved all your problems. Or cause a crash of his aircraft or any of a dozen deaths that didn't involve the Apollo capsule. Why do something with the space craft and put the USA out of the man flight business for almost 2 years. I think this point shows the major flaw in this conspiracy theory. Conspiracy theorists will tell you that Grissom was complaining about the technical problems with the craft (this much is true - that was his job) and he was killed to keep him quiet. Setting fire to the Apollo capsule was the one way to guarantee that the problems with Apollo became well known. Not too clever if you are trying to cover up the technical issues. It also sets up a huge circular argument amongst the Moon landing hoax believers. On the one hand they will tell you that there was not enough time for NASA to land on the Moon BECAUSE of the Apollo 1 fire. Then they will tell you that it was NASA that set fire to the capsule in the first place. As with so much of the HB nonsense the proponents of these arguments do not seem to be able to see the glaring contradictions in their arguments. Yea...we do agree about something! How about that!? I think it's been more the attitude in the posts which spark controversy, rather than the information contained therein. It is fully understood that you're interested in conspiracies, and that you believe that Apollo was a hoax. I too am interested in conspiracies, where the preponderance of the evidence, or more aptly put, the lack of good evidence, may support a conspiracy, or at least prompt an apparent need for further investigation. Apollo, based upon my experience, is very far removed from any such conspiratorial inkling. The evidence and substantiation for it is overwhelming. I should state for the record that your information is not offensive...to me anyway. Well, turb didn't ask me why some people, including the Grissom family suspect sabotage rather than incompetence. He asked what I thought about how the McDonald account fit into the NASA version. I said I really didn't know. I suspect it will make little if any difference. Their investigation was completed long ago, corrections were made, the CM re-built, and the program went on, based on the learning that was provided from the incident. I made a couple comments pertaining to why the family might have this suspicion, but I think the conspiracy buffs have several different reasons, and I am not interested in speculating on what you, as a conspiracy aficianado, already know. After all, your reasons are the only ones that matter, really...because you're the one who thinks there was one. They did indeed fix this situation. The block 2 CM was designed to operate not with a 100% O2 atmosphere at 15 psi (approx), as was the block 1 spacecraft. It was designed to operate with a lift-off composition of around 60% O2: 40% N2 at 16 psi. This would be bled off to leave 100% O2 on orbit at around 6 psi. This was a compromise between the adverse complexity of a multi-gas system for the entire flight and a single gas system, and insured flammability constraints were met on the pad. The 6 psi 100% O2 atmosphere was about as safe flammability wise as the 60-40 mix on the pad, according to tests performed in the wake of AS-204. The Apollo CM was essentially re-designed in very complete fashion after the fire. Grissom was getting shaky about the CM (not even just the LM, which had other problems). Grissom hung a lemon on the module they were playing with. He was going to take it to the press. This is your opinion...and probably the opinion of Mr. Rene. However, it was not one of the "most outrageously stupid events ever in an alleged scientific endeavor" (you see the attitude I was speaking of?). It was something that no one ever thought could possibly happen. It was a wake up call. Given 20:20 hindsight, it is entirely logical to exclaim , "Jesus, how could we have missed that?!" But engineeering programs, arguably rushed, as this was ("Go Fever" is a term assigned to such a thing), sometimes produce tragic and unanticipated results, especially given such a huge project, with so many involved on so many ends of the process. This may be dumb...in hindsight. However, it does not point in any way to conspiracy to murder. Challenger was worse, believe me. Principals were ignored, and a known problem was allowed to go un-addressed due to a change in paradigm. Apollo was was largely an unknown throughout management. Challenger was known. Yet, even that, which I considered malfeasance, was not indicative of conspiracy to commit murder. So they came up with fully explosive-proof switches, which really work. They are totally sealed hermetically. They did indeed come up with such switches. However, no switch was deemed responsible for the fire of AS-204. It was only deadly if there was an ignition source. No one knew there was one. I should mention that Mr. Rene has been thoroughly discredited many times before, based on his pseudo-engineeering credentials. If this represents his comments, then it is a good example of why this might be the case. I think it was Deke Slayton who was going to go into this test with the Apollo 1 crew. Joe Shea was the Director of the Apollo Spacecraft program at the time, and was never NASA's chief administrator (although I wouldn't put it past him to want to get inside with a crew and observe first hand what was going on...). Mr. Rene's mentality is pathologic it seems. It is well known that the Apollo 1 crew was not cremated. It is also ridiculous to imply that the Apollo spacecraft was a "calorimeter bomb" (I think he meant a "bomb calorimeter", which is a device used to measure the enthalpy (thermodynamic potential, or heat content of a system) of combustion of hydrocarbons. A bomb calorimiter is typically filled with O2 at about 300 psi...(the Apollo CM was not a bomb...and there was no explosion). This device in no way approximates the Apollo block 1 spacecraft. Of course Rene thinks this. We know that. It is a massive stretch of logic. Actual professionals in the field do not, and cannot take him seriously. He is utterly unqualified to speak to Apollo 1, nor of any other aspect concerning spaceflight. I am not saying this to be nasty. I am merely pointing out that which is obvious. Others here have pointed out that if this were in fact the case, there were better ways to murder people than risking dozens of lives and millions of dollars of equipment, and exposing the Apollo program to the public scrutiny it received, than causing a fire inside the spacecraft. The idea is utterly ludicrous. All that is neeeded is to logically think about things for a minute and you will see that this is entirely untenable. Yes, Gus Grissom was vocal about his distain for the way the Spacecraft was proceeding. He was not in any way alone in his assessment of the Apollo spacecraft. People were allowed to vent their opinions. "It isn't that we don't trust you, Joe, but this time, we've decided to go over your head." It was sent in jest, a light -hearted testimony to negative opinions about the spacecraft. Joe Shea had that picture hanging on the wall inside the front door of his home. For years, he would never pass through his door without forcing himself to look at that picture, and read that inscription, written to him by three men who had died in that spacecraft. Frankly, the entire idea of a conspiracy to commit murder in the Apollo 1 fire is a massive stretch of imagination. There's nothing to substantiate it whatsoever. MID .... Thanks for your post ... I didn't know much about the Apollo 1 fire or Gus Grissom's career until I found these articles the other day .... I found it curious that the Grissom's would suspect sabatoge instead of incompetence , as I don't believe it would have been in NASA's best interests to have deliberately sabatoged their own spacecraft ... As someone just pointed out on this thread ... if someone wanted Grissom dead so he couldn't talk , there would have been much easier and less expensive ways to shut him up .. I have always had the impression that Gus was the black sheep of the space program though , ever since his "screw the pooch " debacle ... A debacle which was proven not to have been his fault .. and it's a dam shame that he was never properly publicly cleared from any wrong doing when his Mercury space capsule sank to the bottom of the ocean . After reading your replies to this article , I will have to say that I agree with you ( don't fall out of your computer chair ... LOL ) .... I admit that I am a conspiracy believer when it comes to Apollo .. but I don't see anything that would really suggest that these three astronauts were deliberately murdered by anyone at NASA .... It does look like incompetence based on a need to rush through certain engineering matters and problems, which should not have been rushed for any reason .... especially if it involved putting men's lives at risk .